a tourist myself after and during many visits in Aswan. 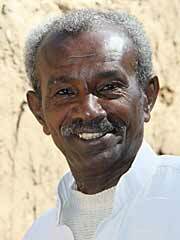 Designing this website I want to say thank you and honour the most warm, honest and trustworthy people I met during my visits in Aswan. Sero (third picture) to coordinate the Nubian / felucca part. Waleed (2nd photo) provides you with your own car or microbus, your own driver, your own guide, to take you wherever and as long as you wish. Also for the Nile Cruises, he is "your" man. Aswan Individual offers modules instead of "packages". You put together what you like and if you need assistance with building your itinerary according to your taste, reserving hotel rooms, fix broken spectacles, even seeing a doctor: we will be at your side! 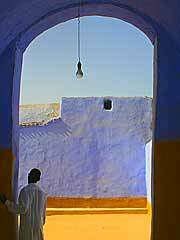 ... to invite their guests to Elephantine or to other Nubian villages. They will share with you a relaxed time on the felucca or introduce you to other friendly captains. Think of the felucca to be "your" sailing boat to sail wherever you like, as long as you like and get out for sightseeing, where it is interesting for you and the felucca will wait at the beach until you are ready to continue sailing. On our website you will find clear descriptions and prices which are fair for the guests AND for the Egyptians. These prices are not negotiable on either side. This website was made for tourists as a help to stay outside hassle and mistreatments - but it intends also to be a chance for locals to be independent from the slave wages that travel companies pay to their local employees. Aswan Indidivual is a project that does not collect any fees or prepayments before you get the service you asked for. Thats why we appreciate when we are notified of any changes in your plans! We will wait for you to arrive and everything you have asked for will have been organised: In case of transfers Waleed will even have paid the cars which have been reserved from our guests by email. Because it has happened that a guest did not arrive, we do need a last confirmation from you 24 to 48 hours before by telephone (and we think it will also be a better feeling for you to have talked to Waleed and to hear that all is prepared for you). To save roaming costs for you Waleed will try first to send an sms, if there is a need to reach you, so you can call him back from any Egyptian phone or send an answer by sms. To save roaming costs for calls you get from your home or to make calls, its a good idea to buy an Egyptian sim card. To help, and although I am "only" the graphic designer of these pages, I (Petra, the tourist :) also help to answer your emails. After building the perfect itinerary for you - including all agreements - it will be given to Waleed to start organizing. Please email us and call Waleed only to confirm shortly before your arrival, not to make arrangements, this would only lead to chaos. With us you are free! You pay for your driver / guide / captain / car / felucca: no matter if you are one or 8 people. You pay only for the service - not for each person. Of course no other tourist will be put in "your" felucca or "your" car! 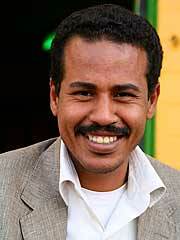 All people involved in the "Network Aswan Individual" are fully licensed and very professional. All vehicles (cars, boats) are new and stocked with all necessary safety equipment. You will NOT! be brought to any papyrus-, spices- or parfumeshop (etc. ), where other service providers usually "collect commission for bringing tourists". We will help you to keep away from mass tourism as far as possible! As in any other country you can give a tip, but no "baksheesh" will be asked from you! After your return we appreciate your opinion. If you have new ideas, if there is anything we could do better or to add informations to our website which could help others. And of course we love to be praised! Please see our guestbook for further proof. "And the idea of Aswan Individual is the opposite of "packages" being sold all over the world. We are not one face from many service providers, and we dont see our guests as one face from many tourists, we are individuals, see our guests as individuals, with their individual wishes." Please read "Before you leave"
I made Aswan Individual to help guests find their way through Upper Egypt (and not to be as lost as I was the first time I came to Aswan), but also to help the locals to get fair wages instead of slavery payment, which usually Egyptian companies working for tour operators give - who sell for low prices, still keep much profit and leave only some coins for the locals. 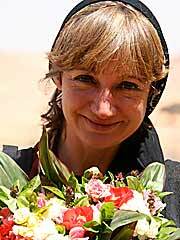 I started working on the website (2005) originally to say thank you to locals that I have met during several visits in Aswan - I am a graphic designer living in Berlin (Germany) and I had thought it would cost me only a few hours to build a few pages recommending them. Google found it, guests wrote in traveler forums, and I still love to help answering emails to guests and to visit Aswan and our "Aswan Individuals" whenever I can. Many websites have been added since then with different ideas, many locals are involved now: chosen because of their friendliness and honesty, who are not intrusive but very hospitable. 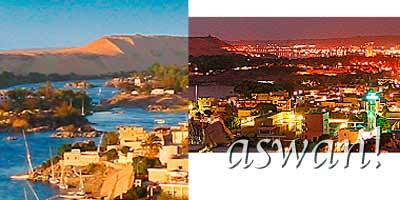 Aswan Individual was the first website for Aswan and without alternatives until 2007/2008. Words spread, Aswan Individual became popular and I gave the project to Waleed who is travel agent in Aswan with all licenses to be responsible and organize in Aswan. The project Aswan Individual tries to be perfect in service, to be "5-stars". This takes a lot of effort and is not comparable to cheap offers. I want the locals to get fair money for their very good service: That's why we put fixed prices on our website: for everyone to see, to compare and to decide. You will see: This project is still less expensive than offers from tour operators. 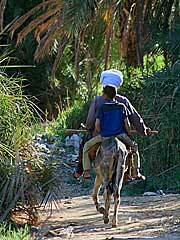 In short: we want you to spend beautiful days in Upper Egypt! This website is "only" a possibility to arrange trips with locals in Aswan before you start your journey instead of looking for them while travelling. Please read in our guestbook from previous guests telling their experiences.